"Turns out that simply looking forward to watching a funny movie can trigger a 70 percent drop in stress-hormone levels, (according to) recent research conducted at Loma Linda University." I even looked it up for you (and myself) because it was so intriguing and soooo true! No wonder I love some good humor after a hard, stressful day. 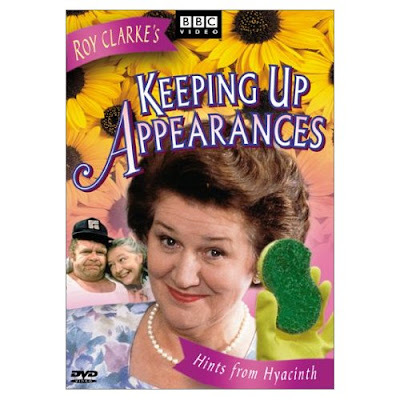 I remember a particular stress-filled portion of my life when I greatly anticipated sitting down at night to watch an episode of one of my all time favorites, Keeping Up Appearances. I'd watch it with my mom and sister, and we'd laugh and laugh and laugh until our faces hurt and the stress would melt away. 2. Think About Exercising...that's right...just think about it! "Just imagining yourself pumping iron is better than nothing according to a Cleveland Clinic Foundation study. For 15 min a day, five days a week, volunteers imagined exercising certain muscles as vigorously as they could. After 12 weeks, the muscles had strengthened by as much as 15 percent. How? Visualization may send signals from the brain to the neurons controlling movement; the stronger the signal, the stronger the muscles. The heart benefit: When your muscles are mighty, your heart rate and blood pressure are less likely to rise when demands on your ticker increase." #3 Eat Fish. We've all heard this one. But reminders never hurt. "Great sources include salmon, trout, and oysters." "The Bucket (Bouquet) residence! The lady of the house speaking!" :O) I love it! Definitely a stress reducer! Look at you quoting a Loma Linda University study...I'm glad you are doing my PR work for me ;)! Yes, that study by Dr. Berk has definitely kept me busy with all the media types. Because really, who doesn't want an excuse to laugh more...and anticipate laughter. Good info for sure...i love that you thought of "heart day" as literally a human organ! I will have to eat more fish...not just fishsticks!